Vernon was John Wister's mansion. A statue of Wister, erected by his grandson, stands to the right of the entrance. Source: Marion. The park is on the west side of the Avenue just north of Chelten Avenue. It contains a variety of buildings and monuments. The park also contains Vernon, the Wister Mansion. The house was built in 1803 by James Matthews. A John Wister purchased it from James Matthews in 1812. His son, John Wister, was a member of Congress and lived in Vernon until his death in 1883. A statue of John Wister stands to the right of the entrance. It was erected by his great grandson, Jones Wister. At one time part of the park was owned by Melchior Meng, a horticulturalist whose gardens were noted for their rare trees and shrubs. Melchior shared with his neighbor Kurtz a love for trees and plants. John Wister preserved and added to the collection while he lived here. 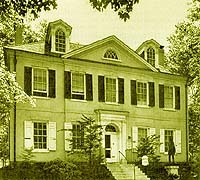 Melchior Meng was one of the founders of Germantown Academy and during the Battle, his house was occuppied by injured soldiers. The house was selected as a hospital because of the numerous barrels of vinegar in the cellar, used then to stanch the flow of blood. There is also a monument to the Battle of Germantown in the park and another to commemorate the coming of the first settlers to Germantown, led by Francis Daniel Pastorius. The Center in the Park is also located in Vernon Park.